The Upshot section was created by the New York Times to compete with departing Nate Silver’s new FiveThirtyEight website in the quantitative journalist field. Dave Leonhardt was put in charge of Upshot and I think he’s a pretty good guy. I sense a concern in him for the welfare of the white working class, which is almost wholly ignored in American discourse. But of course you can’t go around talking about the “white working class” as something we ought to be concerned about. Leonhardt has pretty much banished mention of race from Upshot. This has its advantages, but also the disadvantage that it’s hard to make sense out of anything statistical about America without being cognizant of the racial Bell Curve. You mean, like, the problem is less the schools than the students? The standard negative view of American K-12 schools has been highly influenced by international comparisons. The Organization for Economic Cooperation and Development, for example, periodically administers an exam called PISA to 15-year-olds in 69 countries. While results vary somewhat depending on the subject and grade level, America never looks very good. American schools look okay on the PISA if you adjust for race: e.g., American Latinos outscore every country in Latin America. The same is true of other international tests. In PISA’s math test, the United States battles it out for last place among developed countries, along with Hungary and Lithuania. On the 2012 PISA, white Americans averaged 506 in math compared to the OECD mean of 494. Of course, Americans spend more per student than just about every other country, but the NYT should stop encouraging misapprehensions about the actual structure of American students’ mediocre performance on PISA tests (and on all other tests). No, those rankings are recent and obscure. Those rankings just reify the opinions already held by Tiger Mothers in Seoul and Bombay, which are based on lots of evidence. But there is a problem with this way of thinking. When President Obama has said, “We have the best universities,” he has not meant: “Our universities are, on average, the best” — even though that’s what many people hear. He means, “Of the best universities, most are ours.” The distinction is important. But, also, the “best” doesn’t mean “best at teaching 19-year-olds,” it means “best at attracting famous professors.” In 1975, I was talking to a recent Harvard grad and he mentioned that he’d taken courses from Henry Kissinger, Daniel Patrick Moynihan, John Kenneth Galbraith, and David Riesman. And they were each terrible teachers of undergrads. The fair way to compare the two systems, to each other and to systems in other countries, would be to conduct something like a PISA for higher education. Is it simply unthinkable that tests inevitably measure two separate things: what the educational institutions do and what the students bring? That had never been done until late 2013, when the O.E.C.D. published exactly such a study. I wrote about its results last year. Immigrants dragged down the American scores. As with the measures of K-12 education, the United States battles it out for last place, this time with Italy and Spain. Countries that traditionally trounce America on the PISA test of 15-year-olds, such as Japan and Finland, also have much higher levels of proficiency and skill among adults. … College is voluntary. But when the Piaac numbers are calculated for people with different levels of education, America stills falls short of most other countries. Although race and ethnicity are not expected to be linked to underlying ability, they are often found to be correlated with skill levels in adult populations. Data on race/ethnicity were therefore collected as part of the U.S. national data collection in the Survey (so comparable data from other countries are not available). On average white adults scored highest in literacy, followed by adults of “other ethnicity”, black adults and Hispanic adults13 (Table F.12). While 10% of white adults score below Level 2 in literacy, over a third (35%) of black adults do so, and even more (43%) Hispanics (Table F.13). Similar patterns are observed in numeracy (Table F.14): 59% of black and 56% of Hispanic adults score below Level 2, compared to 19% of white adults. Considerable skills differences between races remain even when comparing those with similar educational attainment (Figure E.10). Only 18 percent of American adults with bachelor’s degrees score at the top two levels of numeracy, compared with the international average of 24 percent. 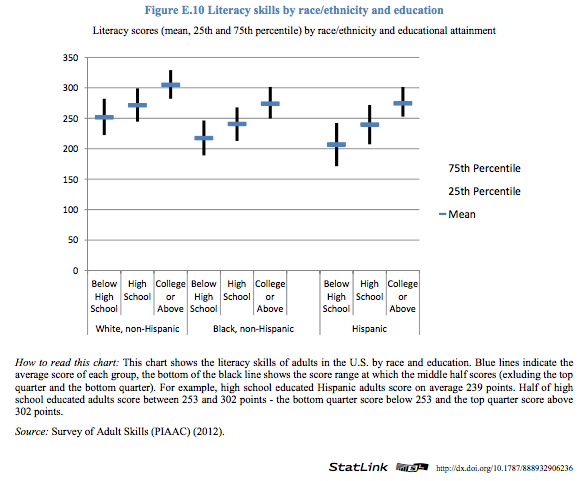 How to read this chart: This chart shows the literacy skills of adults in the U.S. by race and education. Blue lines indicate the average score of each group, the bottom of the black line shows the score range at which the middle half scores (excluding the top quarter and the bottom quarter). For example, high school educated Hispanic adults score on average 239 points. Half of high school educated adults score between 253 and 302 points – the bottom quarter score below 253 and the top quarter score above 302 points. Source: Survey of Adult Skills (PIAAC) (2012). On the literacy test, white college grads had a mean score of 304 while both black and Hispanic college grads had a mean score of 274. White high school grads without bachelors degrees averaged 271, just 3 points below black and Hispanic college grads, compared to 240 for blacks and 239 for Hispanics. White high school dropouts averaged 251, well above black and Hispanic high school grads, while black high school dropouts averaged 217 and Hispanics averaged 206 (the latter probably include a lot of immigrants who aren’t particularly literate in English). Overall, white American college grads averaged 304, one point below the OECD average. Not great, but about what you’d expect.